Caught up with Brett Rogers backstage at the Strikeforce Grand Prix in New Jersey and we spoke about his upcoming fight with Josh Barnett, who wants to see the "best Brett Rogers" in thier match. Brett also talks about Arlovksi's supposed chin troubles and other good stuff. Check out the video. Herschel Walker is enjoying his late-blooming MMA career, and the nice thing is that he really is doing this because it's fun. He has no false expectations of becoming a champion, or even a contender. But he trains hard, is focused and has been showing improvemet in all aspects of the fight game. I met Herschel backstage at the Strikeforce HW GP and got this video interview. Check it out. Jorge Rivera has been having some fun ahead of his fight with Michael Bisping at UFC 127 in Sydney Australia on February 27. We've already showcased some of Jorge's videos that poke fun at the Count, and interview him here as well. But it seems that Rivera, along with the guys at Ranger Up, are really having a field day with Michael. Here is their latest video, and it's a doozy. This one is called: The Tale of Count Bisping. Check it out. For most fans, myself included, you would expect that a fighter, who is one of the top contenders for the UFC lightweight championship, would be more catered to. Possibly having practice start when he got there or maybe at least a bigger welcome when he enters the gym. 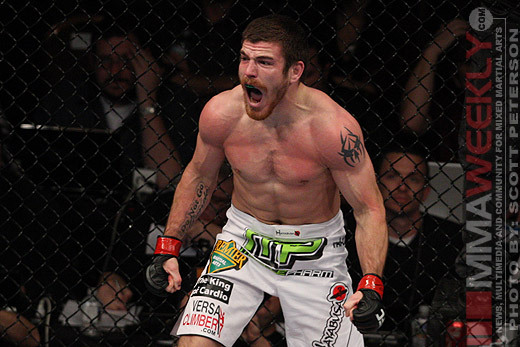 On the contrary, when Jim Miller enters AMA Fight Club, he is simply one of the guys, a couple of nods here and there, some high fives, and that’s pretty much it. But, then again, that’s how Miller likes it. A low key figure within the UFC as well outside of it, Miller’s theatrics happen inside the cage. His constant come forward style has made him a threat on the feet, while his constant attacking grappling game has made him an even bigger threat on the ground. Add to this a bottomless gas tank and you have the makings of a potential champion. His wins over top competitors, the derailment of the Charles “Charles DaBronX” Oliveira’s hype train, and the fact that his only losses were to #1 contender Gray Maynard and Lightweight Champ Frankie Edgar will be sure to put his name on the list of possible championship matches. THEGARV.COM spoke to Miller after a Sunday training with questions varying from his place in the UFC lightweight division to his personal life and how he accommodates being a new father and a professional fighter. Here's the video. Jon "Bones" Jones has come a long way in a short time. 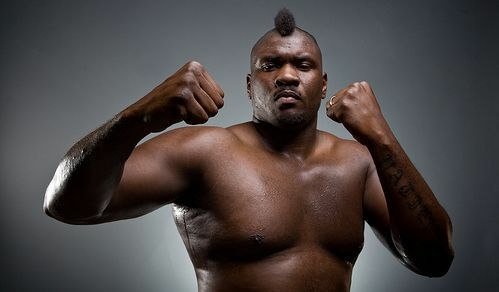 He made his MMA debut in April of 2008. Three years later he is fighting for the Light Heavyweight title in the UFC. That's meteoric, to borrow a favorite Goldy term. Exactly 1 week after Jones made his MMA debut, he fought again at Battle Cage Xtreme 4 against Carlos Eduardo. Even back then, it was clear that Jones was something special. The commentators compared him to Anderson Silva during the fight. Still hard to believe that Fedor got dominated by Big Foot Silva in the quarterfinals of the Strikeforce HW GP last Saturday, but the reality cannot be changed. Big Foot did a masterful job of avoiding Fedor's big punches on the feet, then dominated on the ground. Here are the Gracie brothers with a breakdown video of the techniques used by Big Foot in the fight. Here's a quick interview with Josh Barnett that took place a few hours ago at the Strikeforce heavyweight Grand Prix. We talk about Fedor retiring and about Josh's upcoming fight with Brett Rogers. Brett Rogers has already faced 3 of the 8 Strikeforce Grand Prix heavyweights, and the results were mixed. Rogers knocked out Andre Arlovski, but both Fedor and Alistair Overeem stopped him in their fights. Now he's back and seeking revenge at the Strikeforce GP. I spoke to Brett at the Strikeforce Fan Extravanganza in NYC the other day. Check out the video of him talking revenge, and then hitting the pads. Jorge Rivera is normally a pretty reserved, "all business" type of blue collar fighter who does his talking in the cage. However, the seasoned 19-7 veteran has made a few videos poking fun at Michael "The Count" Bisping, his upcoming opponent at UFC 127 in Australia on February 27th. Something tells me after watching these videos that Rivera doesn't quite respect Bisping's punching power? Two videos of Jorge subtly expressing his opinions on Bisping are embedded beyond the jump.